What are the Indigenous 'Big House' Laws that Jody Wilson-Raybould Invoked? UN Declaration on the Rights of Indigenous Peoples: Is Canada Living Up to It's Commitment? This past weekend and the first weekend in June concluded the Truth and Reconciliation Commission (TRC). This was the last of all of the TRC events in Canada. There have been seven national TRC events since 2010 and the eighth event was the closing in which the findings of the TRC commissioners were presented. I felt a cosmic pull -- that I had to be in Ottawa to recognize this time in history. More importantly, I went to the TRC event to honour my family and ancestors who were forced to attend residential school. Residential school has directly impacted my life, as my father and many of his brothers and sisters, who are Dene from Lutselk'e, attended residential school. 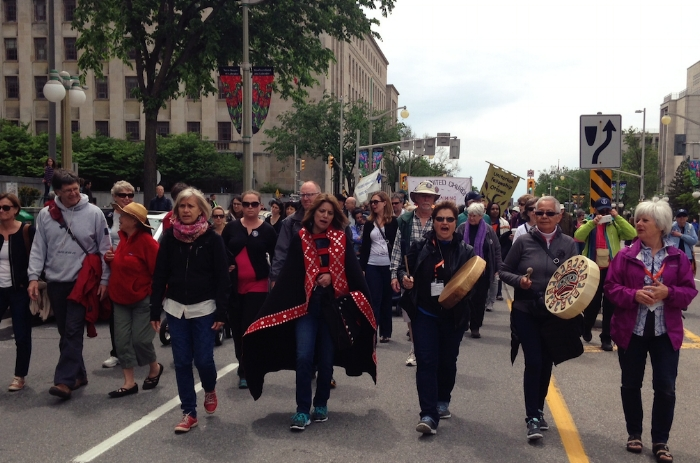 The weekend of events started with the Walk for Reconciliation in Gatineau, Quebec. I got to the event just in time to hear Commissioner Marie Wilson, honorary witnesses Clara Hughes and Joé Juneau give their impassioned speeches. We then began our walk across Gatineau, passing the Supreme Court of Canada, Parliament Hill and Ottawa City Hall -- places where such assimilative policies began and were permitted to continue until the last school was closed in 1996. When I arrived at City Hall there was an energy in the air. It felt like we were all on the cusp of something -- something important that was about to take place. There was an informal group of West Coast First Nations who were singing the Women's Warrior Song. This song is one that's more well-known on the West Coast and permitted to be sung by all. I joined in and sang with them. Someone handed me her drum, and the survivors went into the centre of the drum circle and started dancing in their respective long house and clan dances. I held up my hands to the survivors to honour them and their experiences. I was tearing up, seeing their courage in coming forward and our own ability to come together in this way. There were many great speeches and musical performances that day at City Hall. By the end of the day, I was looking for my auntie Jean Cardinal and her partner Roy Erasmus, and decided to go inside City Hall to look for them. Instead of finding them, I came across the Witness Blanket by artist, Carey Newman (Ha-yalth-kingeme). It isn't a blanket at all, but a series of wooden panels, including photographs, news articles, documents, art and objects that residential school survivors submitted. I talked to a survivor who had submitted a strap that was used on her and other children by residential school teachers. I was unbelievably moved by the power of this art and its ability to capture survivors' experiences from across Canada. The next day I finally connected with Jean and Roy and we attended the TRC together. I got to speak with Roy, and his younger brother Billy Erasmus about my family from Denendeh. Our conversation warmed my heart. Over the whole weekend, I thought of my family, missing them. I finally felt that, even though I'm so far away from my family, we are all connected, and we were together in spirit at that event. That day there were talks by many esteemed scholars, officials, and dignitaries that focused on subjects like United Nations Declaration on the Rights of Indigenous Peoples and reconciliation. The scholarly work that was presented was balanced with First Nations culture. In the foyer of the hotel where the conference was taking place there was impromptu drumming and singing. It unified and grounded a common purpose in attending this event. I had to leave the event early to head back home. Sadly, I couldn't attend the findings of the report in person. Like so many people across Canada, I watched the closing events, streaming them online. Every speech, every video, the report and its recommendations presented that day will have a lasting impact on the future of Canada. It's time for us to take up reconcili(action) now.